As the winter months set in and Christmas drew closer ICFC was busy fighting, competing having fun and procrastinating our heavy work loads. 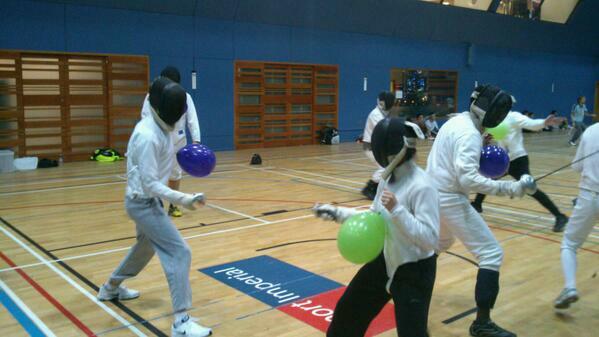 Training has continued as normal, with highlights such as ambidextrous fencing, and our strength and conditioning coaches attempting an Iron man of foil, epee and sabre matches and novel foil scoring system involving balloons for the novices for the end of term. BUCS matches have continued, both the men’s and women’s 1sts having there first weekend fixtures. The men dominated their weekend in Oxford on the 16 and 17th of November, although with some almost photo finishes they won all th, see Camille’s match report for the full story. The women’s 1st team struggled more on their weekend hosted by Surrey on 23rd and 24th November , as although the epee and sabre teams did well, they were weak on foilists, see Emma excellent match report coming soon. The womens seconds have got through the first round of the cup on the 11th December and the men’s seconds and thirds continue to hold there own in there leagues and look forward to their cup matches. Thanks and good luck to everyone on the teams this term! Socially the club has continued to be very active, as well as Union/Eastside trips after training, we had Christmas dinner (organised by our lovely social sec becky ) which was a success with over 25 people coming down to Hammersmith to listen to me make a fool of myself eating Christmas pudding and be festive. As a end of term treat our valiant Vice President Loek lead an expedition to our enemies to the North, aka UCl in a friendly match where we won 110-109, congrats guys. In individual competitions we also had a very good term, the National Novice Championships at Warwick we sent out a few enthusiastic novices for their first taste of competition and they all did incredibly well with our very own Novice Captain Cosmin placing 3rd in foil. At the Beazley British National Championships sabreurs Maiyuran and Zoe both won bronze. 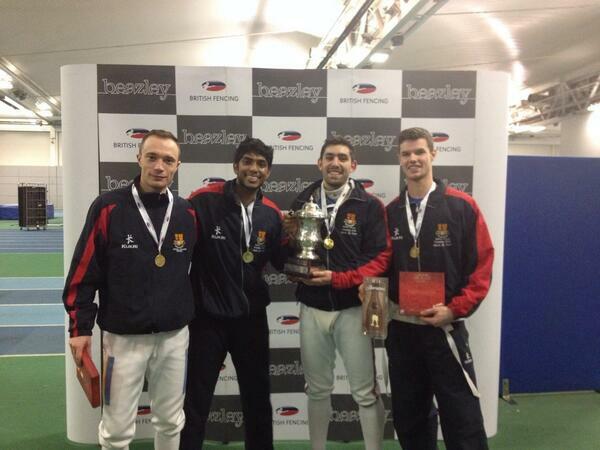 Also Imperial Men’s Sabre team won the team nationals making them the best sabre team the country, well done guys! Next term we looking forward to a huge amount of BUCs including the Individual Championships on 21st to 23rd February and BUCS Big Wednesday on the 26th March. Also over Valentine’s weekend we are going to Paris to fence at the Ecole Polytechnique in a team and individual competition called Challenge international d’escrime 2014. Watch your emails for detail on all of these! At the start of term the intermediate course is starting up for all novices continuing into the new year.